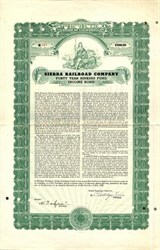 Beautifully engraved Certificate from the famous Sierra Railroad Company issued in 1936. This historic document has an ornate border around it with a vignette of the California State Shield. This item is hand signed by the company's president, C. Coolidge Kries and secretary and is over 74 years old. Punch cancelled. 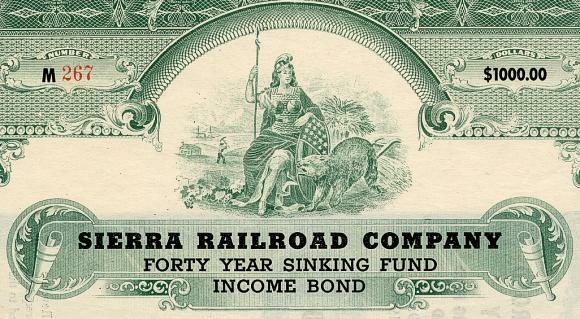 The Sierra Railroad is an historic shortline railroad connecting the foothills of California's Sierra Nevada mountains with the San Joaquin Valley. The railroad has hauled freight under the name "Sierra Railway," 1897-1937, and the "Sierra Railroad," 1937-present. Several of the Sierra's steam locomotives, as well as its shops and roundhouse are preserved at Railtown 1897 State Historic Park in Jamestown, California. Passenger excursions are operated by Railtown under the original Sierra Railway name. On February 1, 1897 Thomas S. Bullock, Prince Andre Poniatowski, and William H. Crocker joined together and formally incorporated the Sierra Railway Company of California. The first train to Jamestown arrived on November 10, 1897, hauling lumber, the railroad's primary product. The Sierra Railroad Company converted from steam to diesel locomotive power in 1954 with the purchase of a pair of Baldwin-Lima-Hamilton S-12 switchers. In 1970, Charles Crocker, grandson of Sierra Railway Company founder William H. Crocker, transformed the Jamestown yard and shops into a tourist attraction called Railtown 1897. Railtown 1897 became a State Park in 1981 when the state of California purchased the 26 acre Jamestown complex for $750,000 from Crocker Associates. Approximately 45,000 people visit Railtown annually.